When I travel to a country that isn’t English-speaking, I usually equip myself with the basics of the language to get by. I have a pretty good ear for languages and can pick them up fairly quickly. My level of Spanish is Dora the Explorer although my limited understanding is better than my spoken. My understanding of food is pretty good. I was so busy before this trip that I did no advance preparation. I’m very lucky I’m travelling in a pack that has a decent grasp of what’s happening around me and can translate for me, otherwise I’d completely be lost here in Oaxaca. 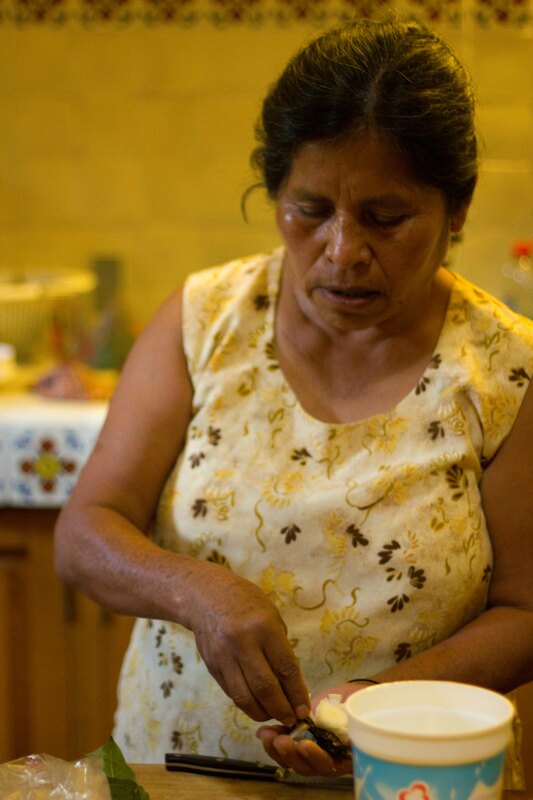 One of the things that was set up for me in advance was a “lesson” in Oaxaquan cooking from Reyna, the housekeeper at the place we’re staying at. On the menu was enchiladas de pollo. Although enchiladas wouldn’t be my first choice, I didn’t have much of a choice but to go along. 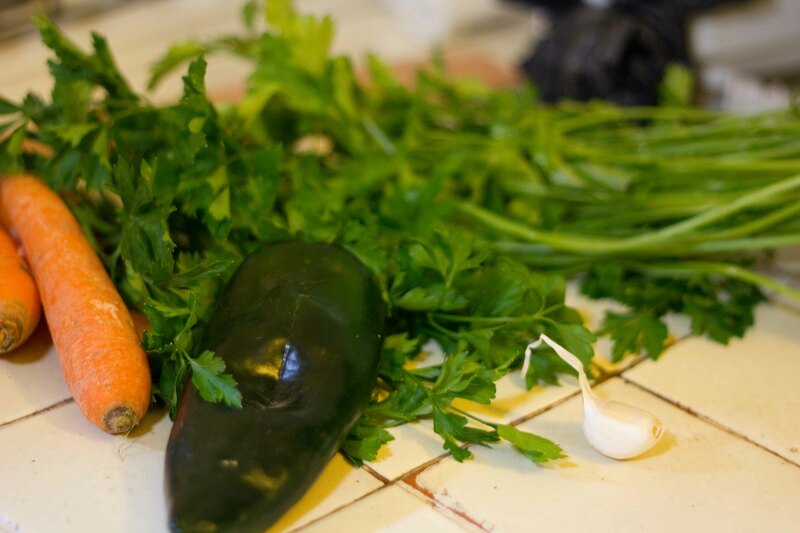 Reyna sent her husband to the market to pick up chicken and the rest of the ingredients we needed for the enchiladas. Senora Reyna getting the ingredients together. We thought we had requested thighs, but got drumsticks instead. 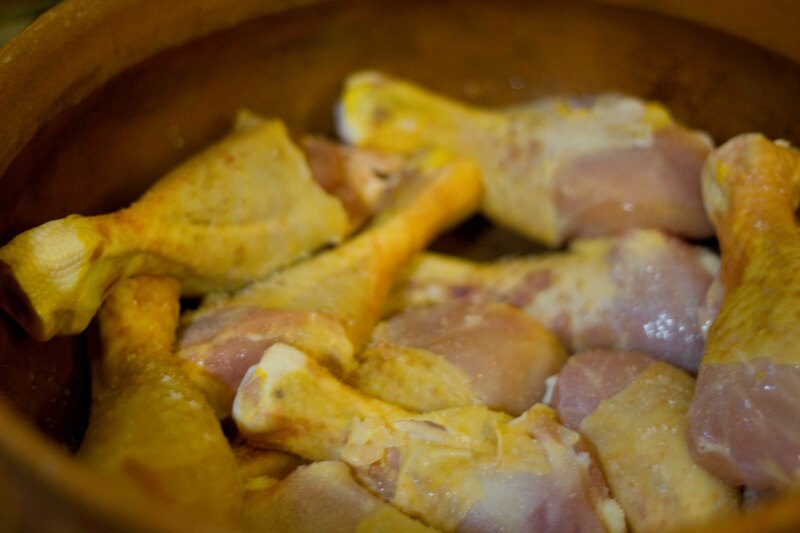 To go “lower fat”, half the skin was taken off each drumstick. 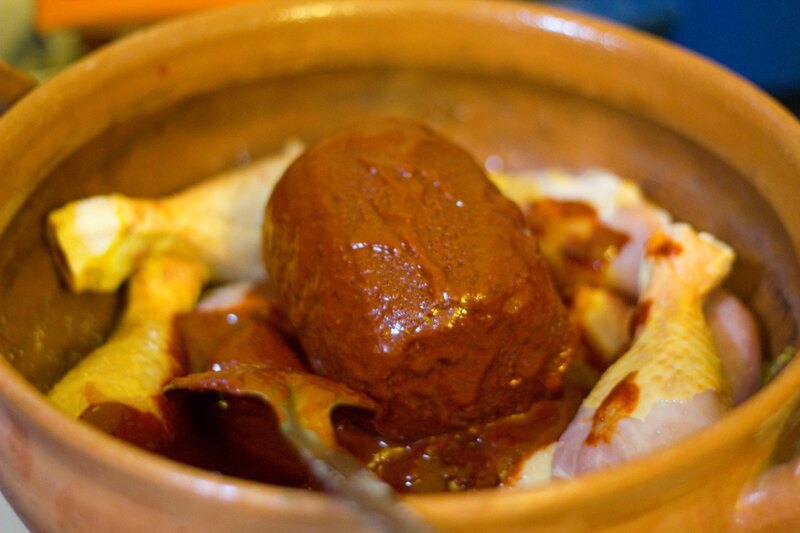 The chicken was placed in a single layer in a dry, hot cazuela (clay cooking pot). 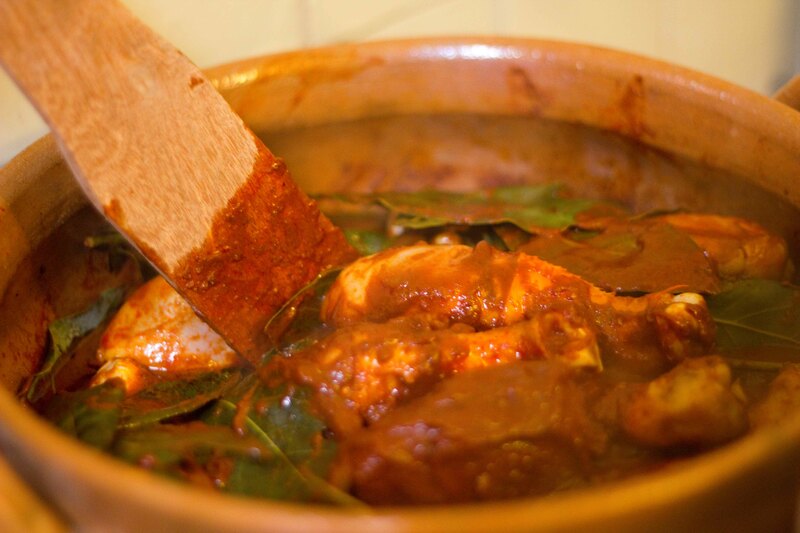 Reyna made the sauce in advance which contained guaillo chiles, garlic and cloves. 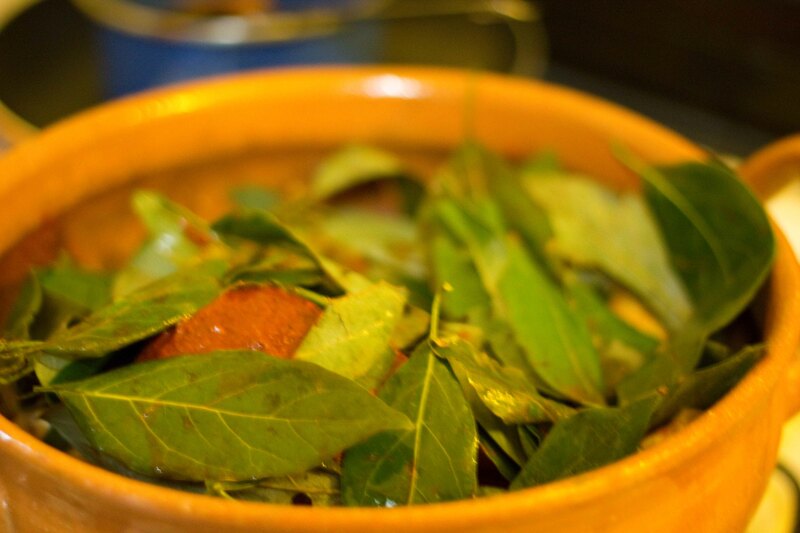 The avocado leaves were placed on top and then the whole thing simmered covered for over an hour. Vegetables for the rice – Just to be safe, the vegetables need to be disinfected. Reyna was going to wash them in Palmolive until we showed her how to use the Microdyn, (disinfectant solution). 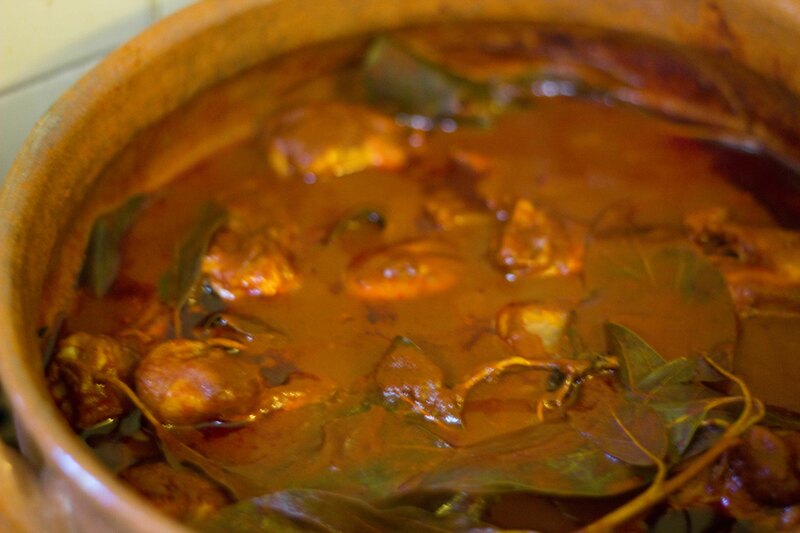 Oil was heated in the cazuela and washed rice is added and fried. 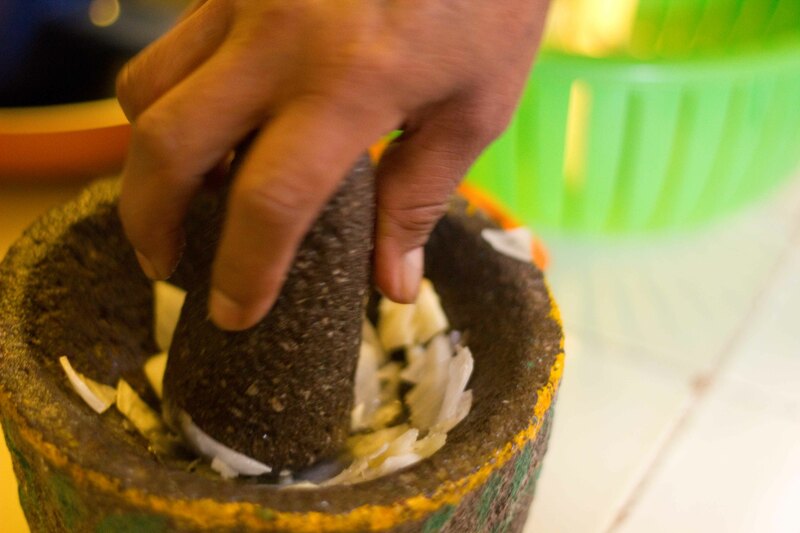 Onion and garlic ground in a chilmolera de peidra (mortar). 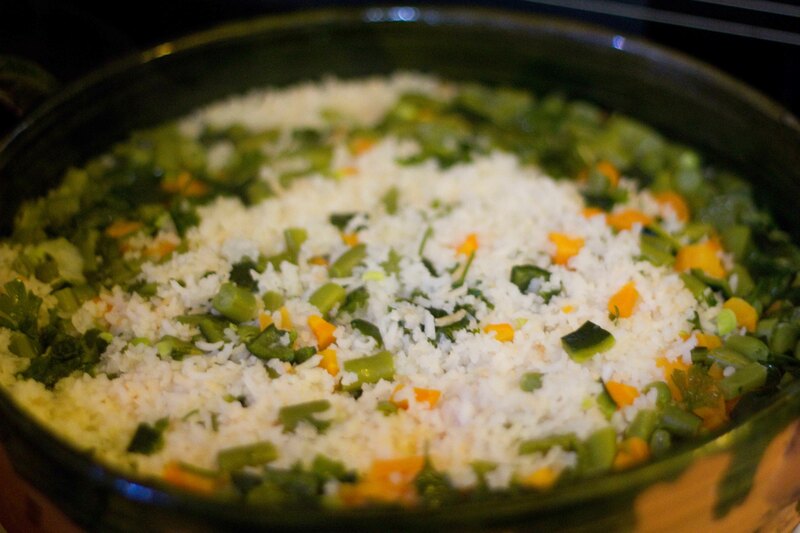 This mixture and water was added to the rice after 20 minutes of frying. 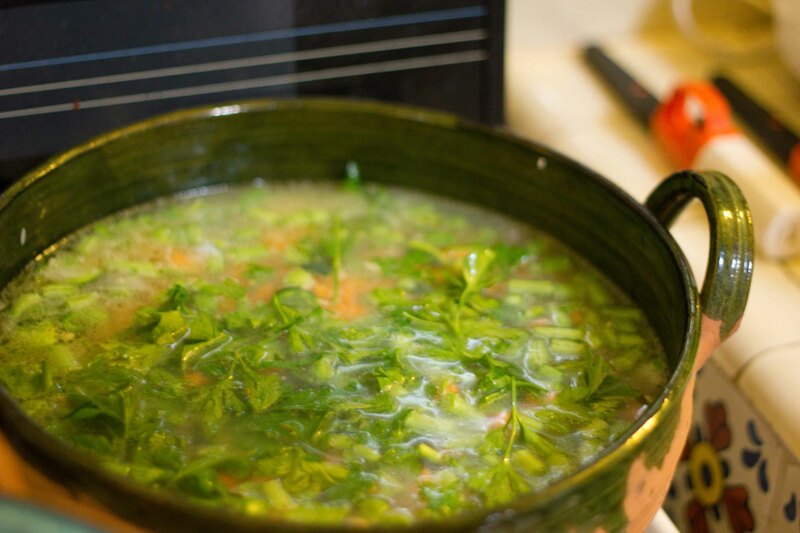 The vegetables were placed into the boiling water and cooked until the water evaporated. 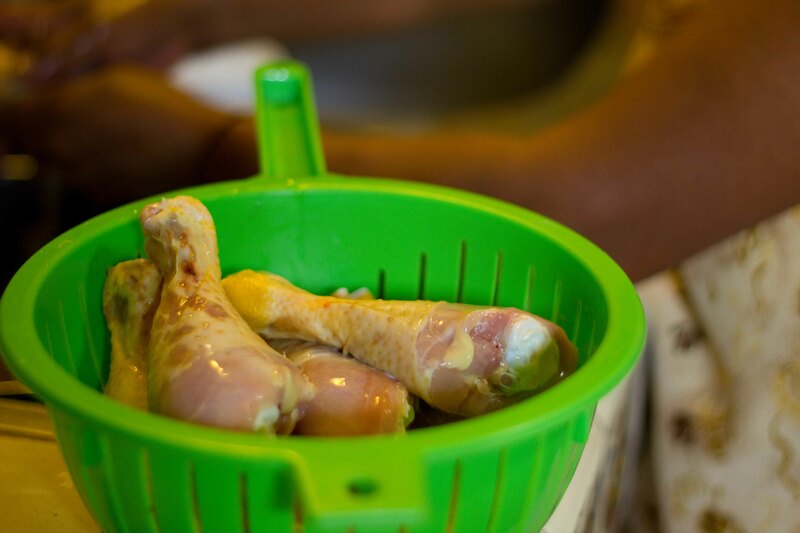 The chicken needed to be stirred throughout the process, to avoid burning. At this point it started to look and smell delicious. 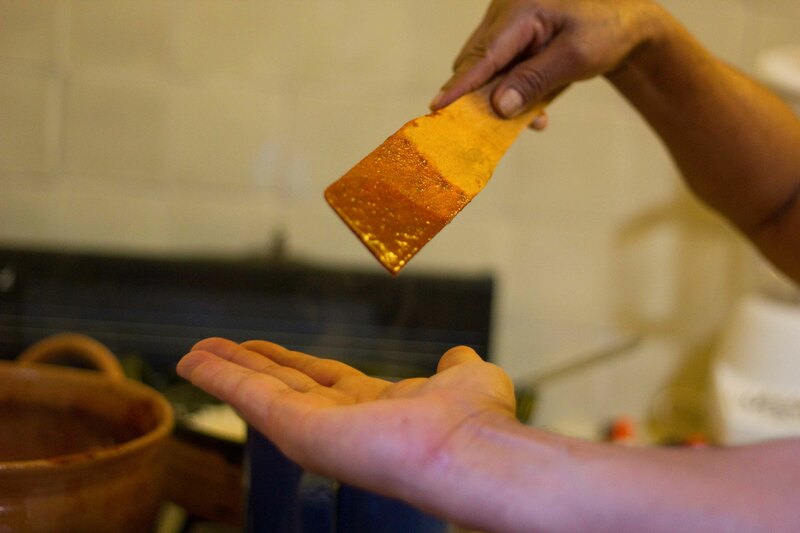 Reyna taught us the proper (hygienic) way to taste was to drip the sauce into your hand. At this point I started to wonder about these enchiladas. There didn’t seem to be any cheese, there were no tortillas, there were just no makings of what I thought were in enchiladas. But then again, I thought, maybe Oaxaquan enchiladas were different from the Tex-Mex ones I know. I found out we needed to get tortillas, so I asked if I could tag along to the store to get them. On the walk there, I found out that we were not making enchiladas de pollo, but in fact we were making pollo enchillado (chicken cooked in red chile sauce). No wrapping and rolling, nothing covered with cheese and then baked. Imagine my surprise to realize that I had been in the kitchen for over an hour with a picture in my mind of what the end result would be, only to have bubble burst. 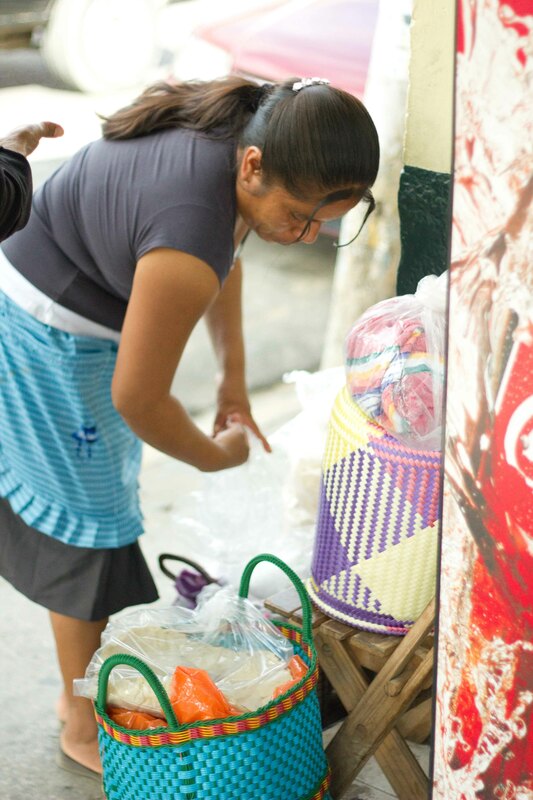 No worries though, as I was soon distracted by the wonders of the corner tortilla woman. Multiple varieties of tortillas sold on the corner, and not in the store. We bought blanditas (large thin tortillas). When we got back the food was ready, which was great because I was starving by that point. 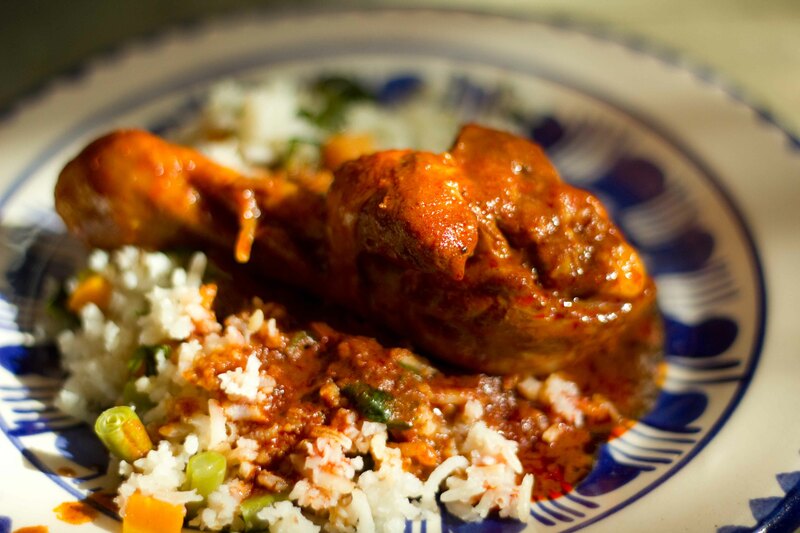 The finished pollo enchillado was rich and there was a great deal of complexity to the sauce. The rice was so soft but the vegetable retained a bit of bite. 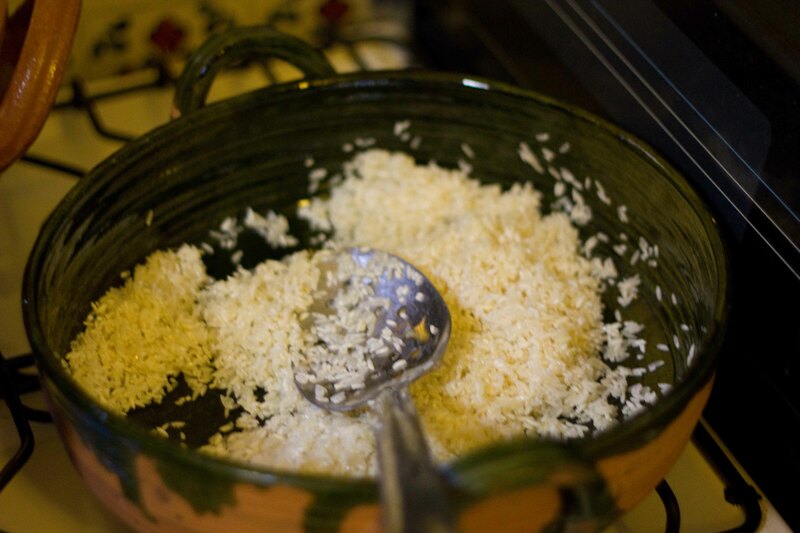 The rice was good, but could have been great had it been cooked with chicken broth. Awesome re-count of the adventure. So funny that you made something completely different!